Hello everyone, this article is targeted to .net developer who wants to use Mysql as a back end and entity framework as ORM with code-first approach. I have created a console application for this demo.After adding a console application add these packages by using Nuget. MySql.Data.Entity. 6.8.8 (I have faced some issue with the latest version of this dll so I have used 6.8.8 ). 3. 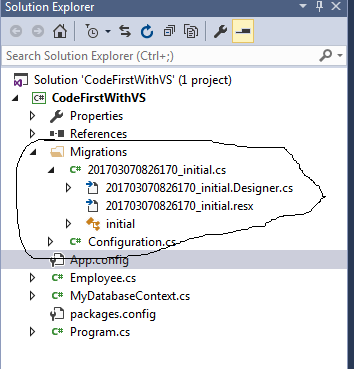 Add-Migration initial // to add migration or to create fresh script And you also noticed that in your console application, under Migrations Folder a temp file is created. This file will get modified automatically each time we update our database. 4. update-database// to update the changes in database. Now before running the migration commands your mysql look was like. So these are the steps required to achieve the desired result.Hope you liked it.